Discover a more collaborative, real-time way to manage task lists. Whether you’re managing a group project at work, planning an event, or organizing your daily routine, creating a detailed task list will help ensure a smooth process and a successful outcome. We’ve compiled a variety of the most common and most useful task list and checklist templates below — click through the sidebar to find options for basic, business, or personal needs. You’ll find free downloadable templates as Excel, Word, and PDF files that are designed for easy customization and printing. 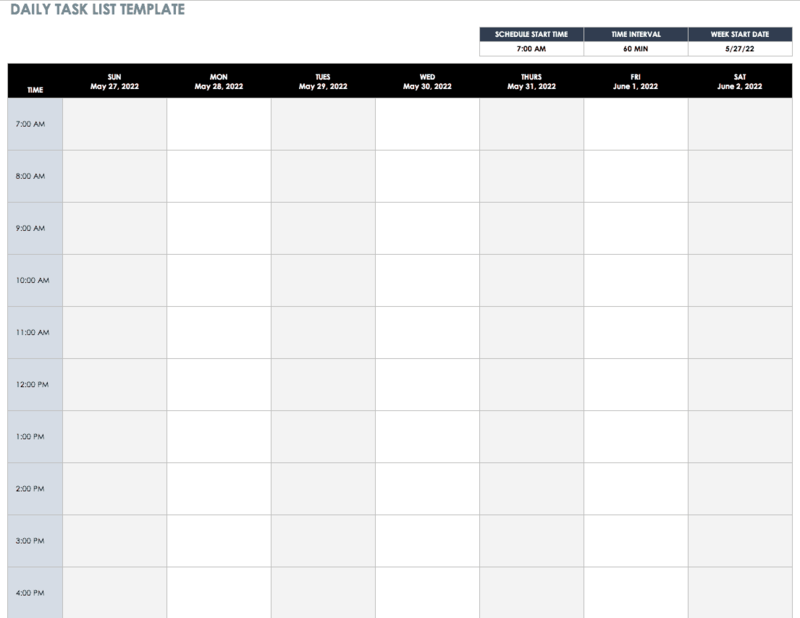 Use this template to keep your team organized and cut wasted time in status meetings. Create a centralized view of all team member's responsibilities across multiple projects. 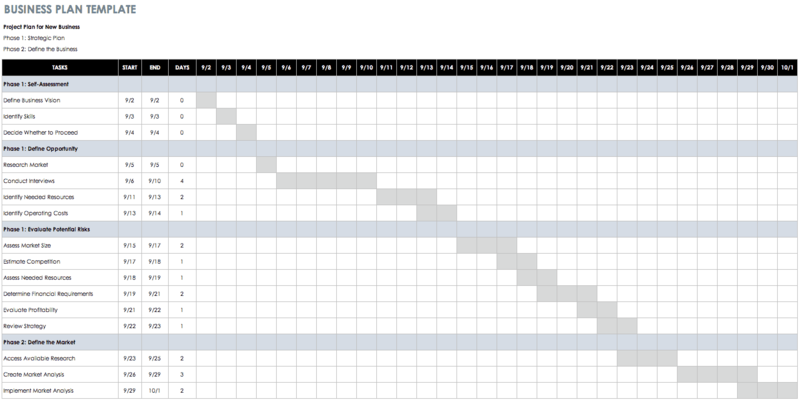 Get a visual picture of your scheduled tasks with this Gantt chart template. Often used in project management, a Gantt chart shows the duration of each task as a horizontal bar that spans start and end dates. Thus, it’s easy to see the different phases of a project, identify dependencies, and prioritize tasks. A Gantt chart can be useful for managing any task list that spans a set period of time. 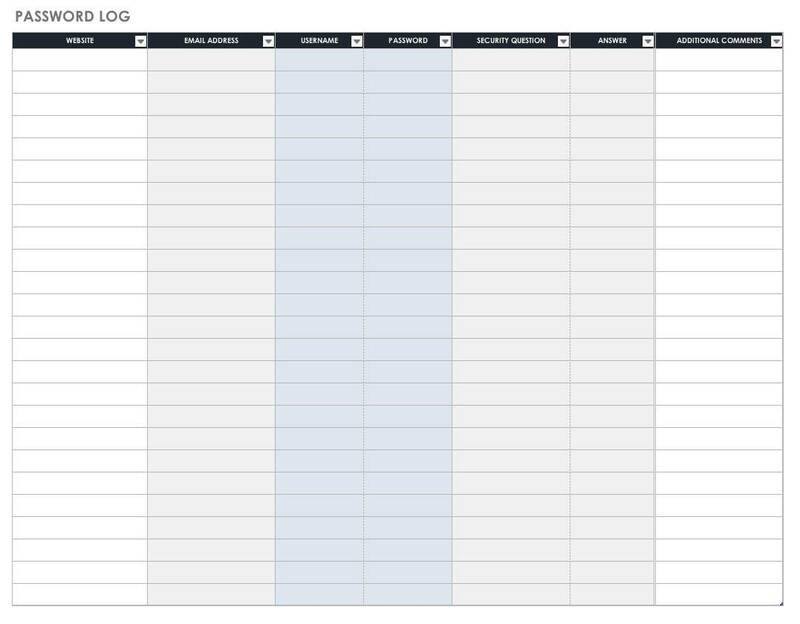 This task tracking template documents the progress of each item on your list, so it’s easy to assess the status of individual tasks or an entire project. There is space to list start and end dates, as well as to mark completed tasks. This template keeps things simple by providing only essential tracking information, but there is also space for notes in case you need to include further details or instructions. This template is designed for project management, and it can be used in both a business or personal setting. The template provides sections for project tasks, priority, deadlines, assignees, and deliverables, and it allows you to track project costs and compare estimated to actual hours. 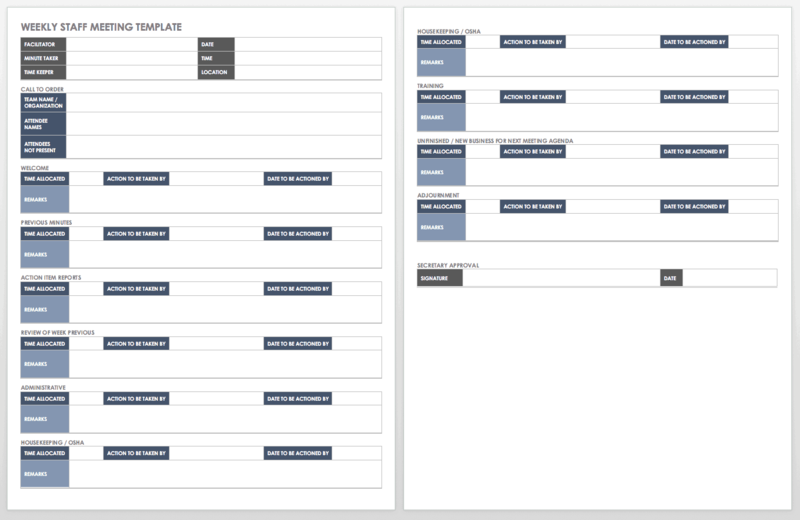 This is a detailed template that can easily be edited to match the exact needs of your project. This weekly task list schedule includes columns for assigning a category to each item, along with deadlines and completion status. The default weekly calendar runs Sunday to Saturday, but you can also choose the starting date for the week. 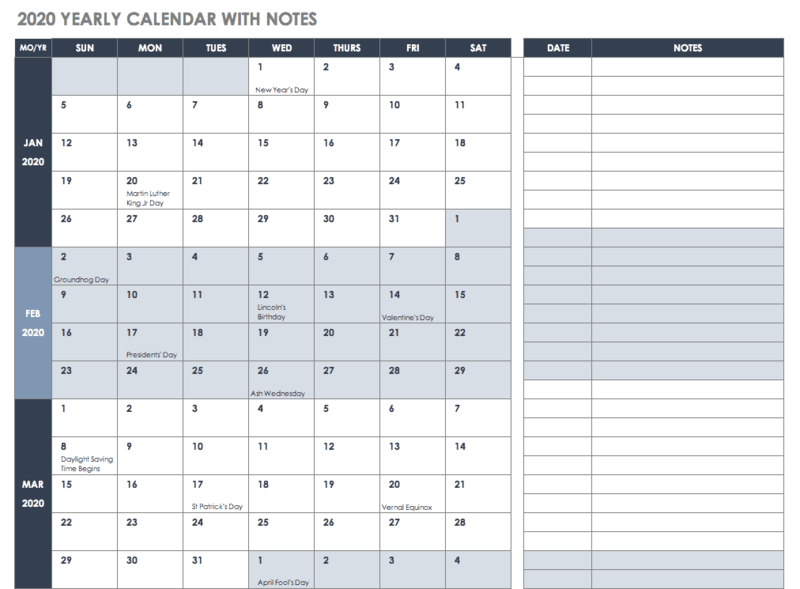 If you need a combined calendar and task list, this template offers an easy solution. You can use this daily task list template to schedule tasks throughout the day while also planning ahead for an entire week. Choose the starting time for each day, as well as the starting date for your weekly calendar view. You can also adjust the time interval of each task, which allows you to break down each hour into incremental tasks, if needed. This simple to-do list template includes drop-down menus for indicating priority and status on each item. When a task is marked as complete, the row changes color; this enables you to quickly spot which tasks are still in progress or have yet to be started. 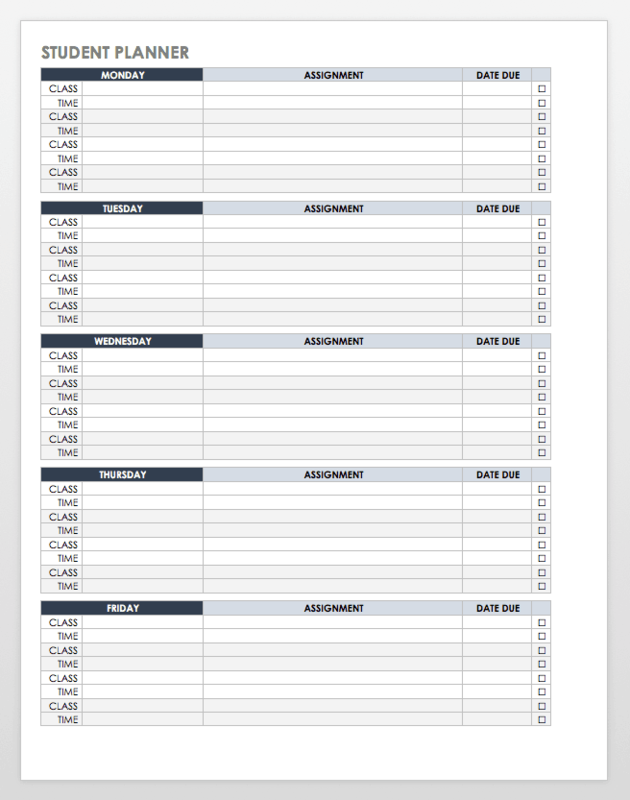 This task template could be used for a broad range of applications, from organizing homework assignments to planning an event or tracking work projects. 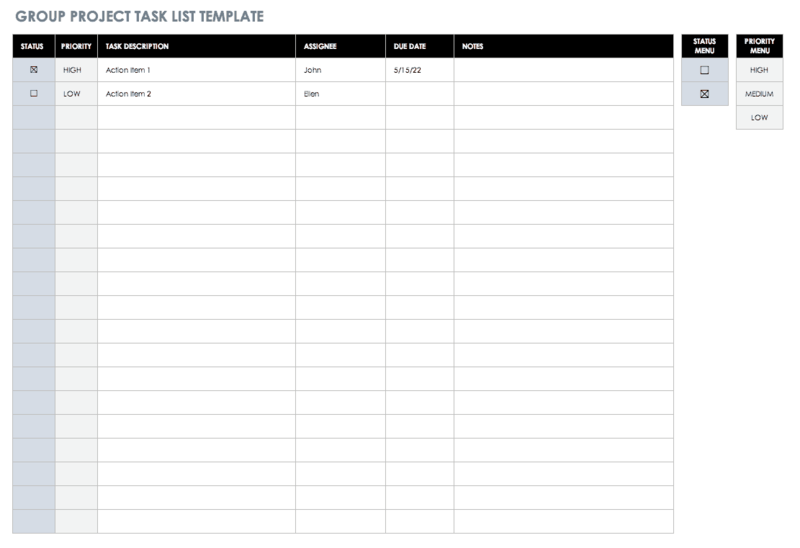 This template is a step up from a basic to-do list, as it allows you to rank your tasks with the highest-priority items first. There is also a section for notes where you can elaborate on your tasks or add reminders. 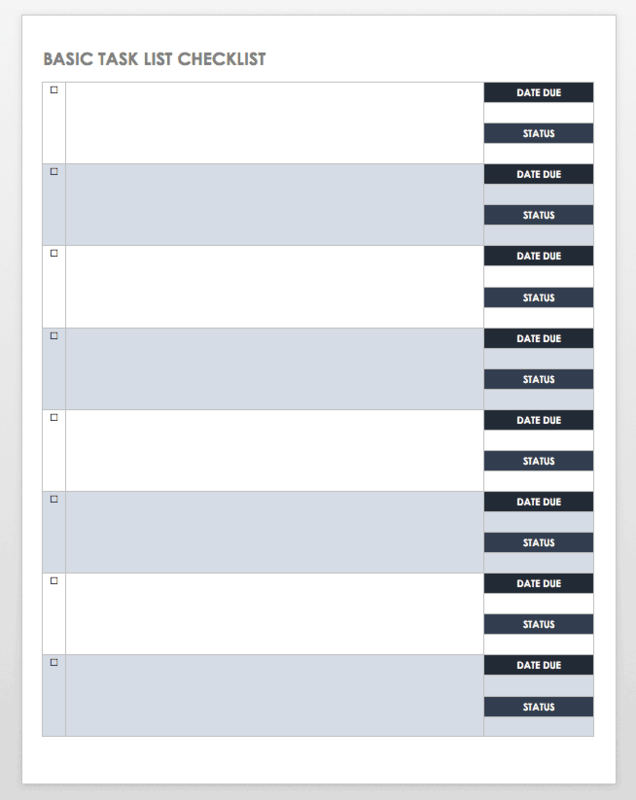 This template offers a simple way to stay organized while ensuring that you don’t overlook high-priority tasks. For a high-level look at your schedule and upcoming tasks, use this yearly calendar template for 2019 and 2020. The template displays a standard January-to-December calendar, so you can view your long-term projects and tasks at a glance. 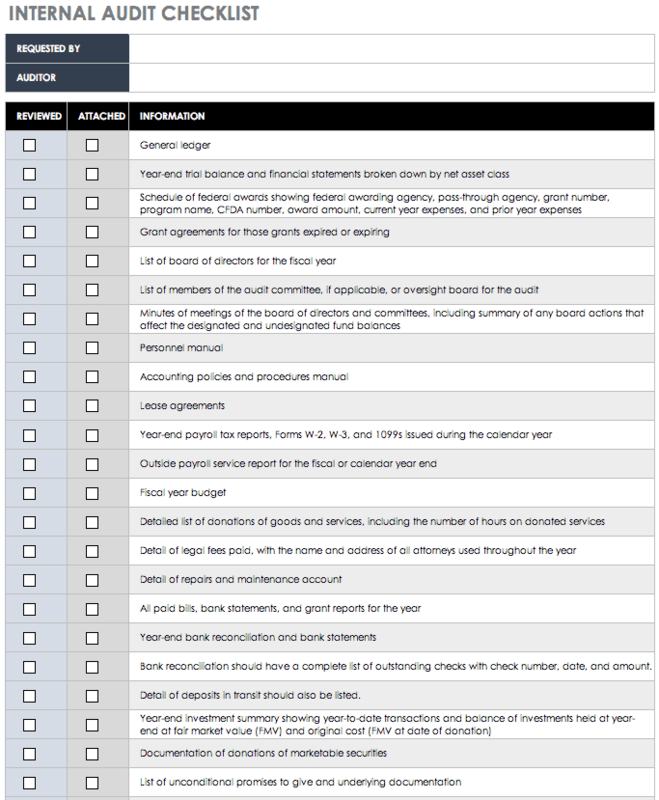 This task checklist offers a basic outline with checkboxes for each item on your to-do list. It also has sections to note the due date and status of each task to assist with planning. 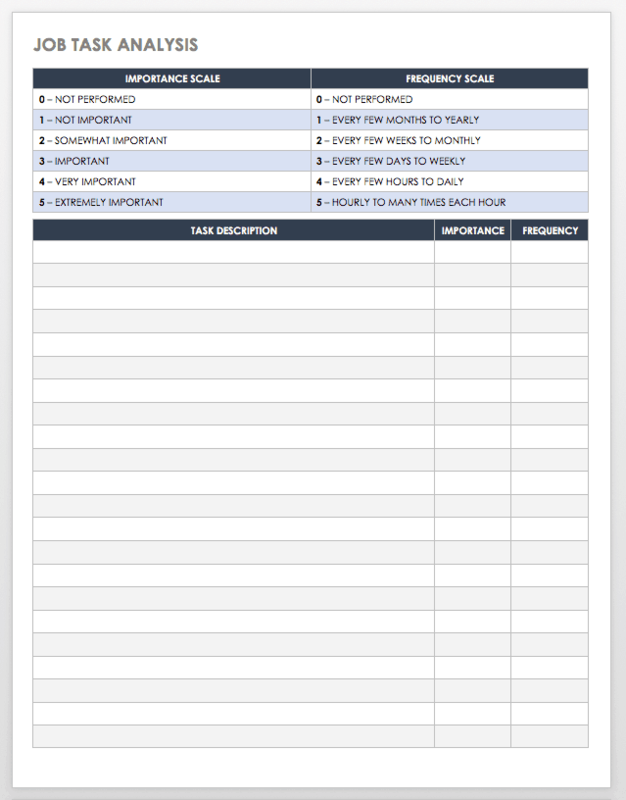 After downloading this template, save a blank version so that you have a master copy ready to print and use any time you need to create a new task checklist. Use this task analysis template to determine the resources and time required to successfully complete a given task. The template includes sections for delineating the steps involved in a task, the resources (human, mechanical, or monetary) required for each step, and the time spent on each item. This provides a detailed analysis of a task, which can be useful for training purposes or for any situation where you need to evaluate a process. Help your team stay organized and on task with this action item list for Word. 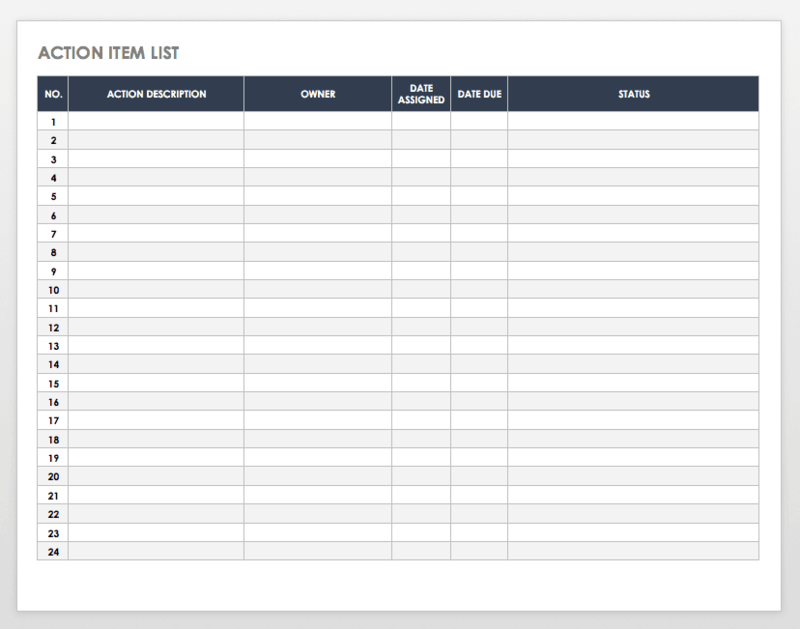 The template includes a tracking number for each action item, start and due dates, the assigned owner for each task, and a notes section for adding updates or resolving issues. By defining and scheduling tasks as actionable items, you can track individual and team progress — and in the process, create a useful communication tool for all team members. This template is designed to help you keep track of the passwords to all of your various accounts. List each account, and then fill in the columns for website URL, email address, username and password, security questions and answers, and any additional notes. Save the form to your computer or print a hard copy — remember, though, to store the information in a safe place and and not to share your passwords with anyone. This template can help you stay organized when planning an event, such as a dinner party, a baby or bridal shower, a wedding, or a birthday party. Simply list each task and the person responsible, and assign a priority level to the task so you and your team can prioritize the many moving pieces. Additionally, note the due date and date completed — any discrepancy between the two dates will help you more accurately plan the timeline for your next event. This template, available in Word and PDF, is ideal for families who want a central resource to organize family tasks. The template provides separate tables for each family member to list their individual tasks, and then register due dates and notes, along with a column to mark completion. Of course, you can add or delete tables as needed. 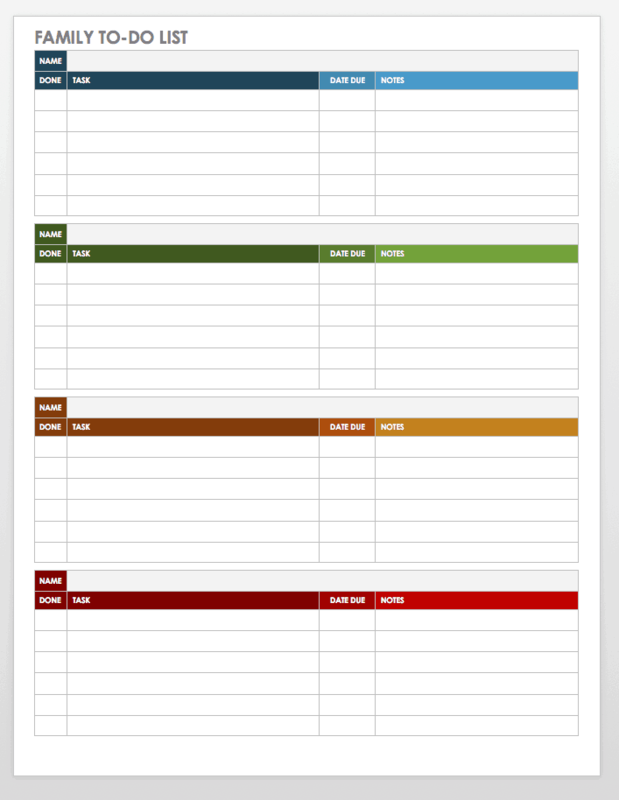 This chore list template allows you to create a weekly schedule for all of your household tasks. 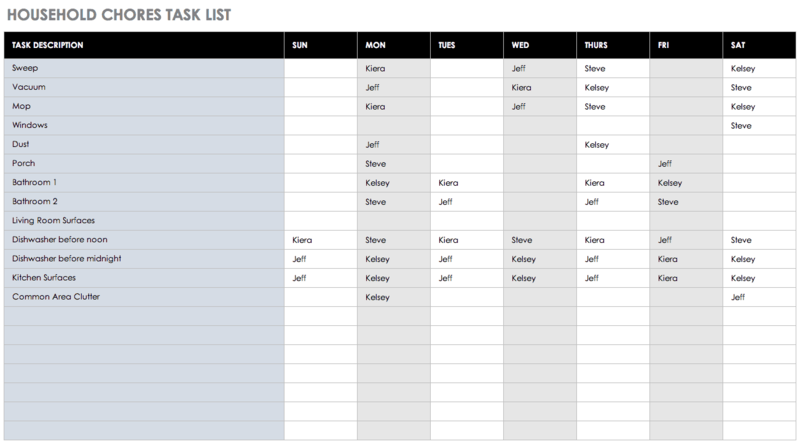 Create a list of tasks and assign each item to an individual for any day of the week. 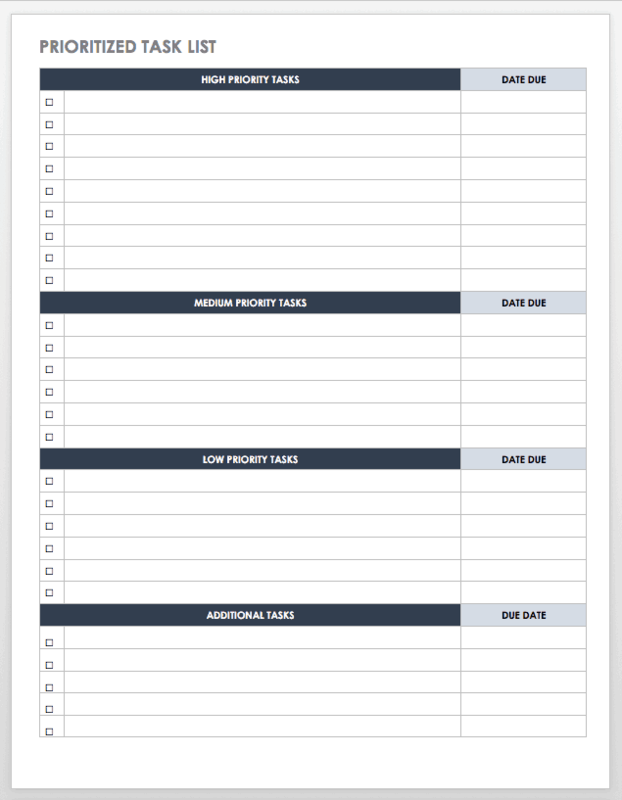 With a simple format, this template is easy to use, so you can streamline the planning process and start organizing your home. Additionally, you always have the option of saving the template as a PDF and printing a copy to share with others. In the construction industry, a punch list is a document that you complete toward the end of a project. In it, the contractor or property owner lists any work that has been done incorrectly or does not meet the specifications outlined in the original contract. The construction team then uses this punch list as a reference to complete or repair the work items before the project is officially closed. This punch list form provides a separate table to list each work item that needs repair or attention. Save the PDF form, print it, and fill it out by hand for easy use. 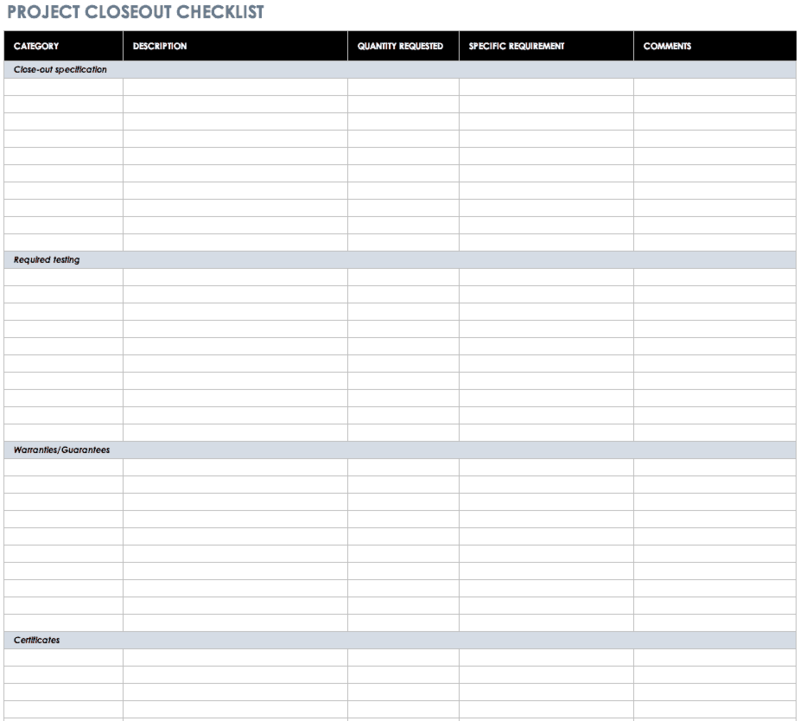 Use this checklist to ensure you have completed all necessary tasks in a project. This template is designed with construction projects in mind, but you can edit the categories to reflect the needs of any multidimensional project, whether it pertains to building, real estate, or business — or even as a termination checklist if you are ending an association, an agreement, or a hiring arrangement. Simply list each task, the quantity requested (if applicable), specific requirements, and any notes. This easy-to-use form serves as a final check so you don’t overlook any requirements as you prepare to officially close a project. Before you embark on a project, you should perform a risk assessment. While you can’t control or prevent every possible risk, taking the time to assess the possible threats to your project will help you plan for and mitigate some hazards. 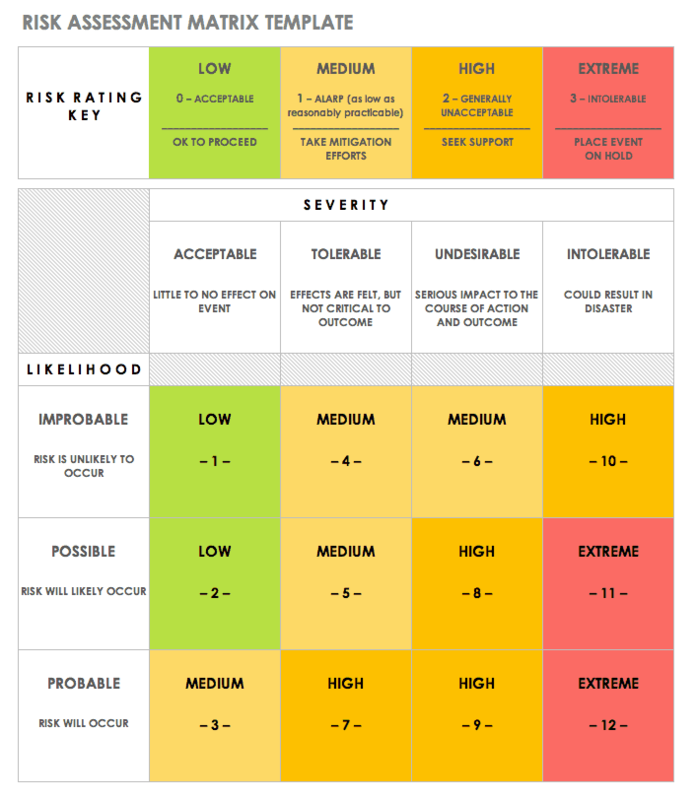 This matrix allows you to perform a qualitative risk assessment, gauge the probability, and predict how each could affect your project budget, scope, and timeline. The template also provides space for you to list events that could trigger each risk, designate a respondee, and make notes for a response plan. 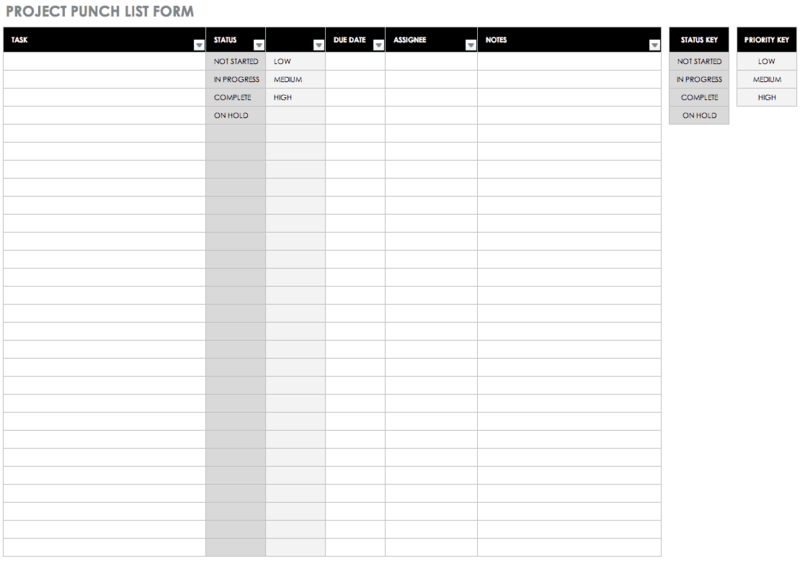 This simple form allows you to list contact details for each customer or client. This list includes columns for the company; the name, title, email, and phone number of your contact; and any comments. 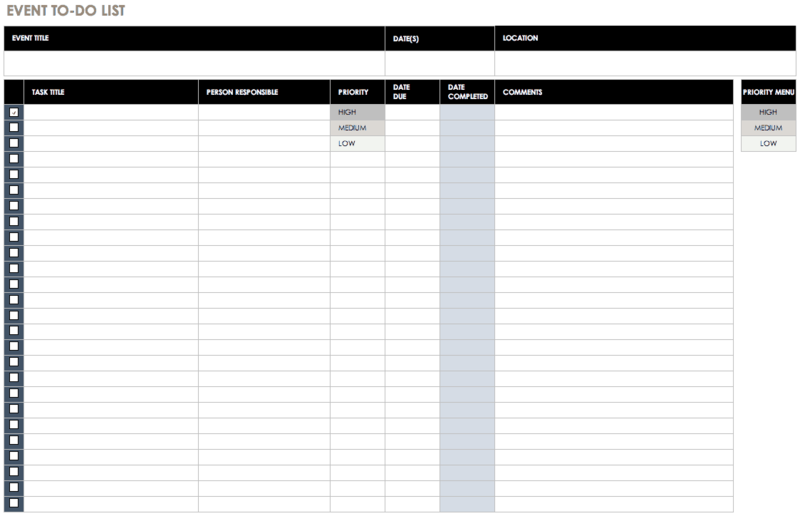 You can or remove columns as necessary, and highlight or flag certain customers who you need to follow up with. 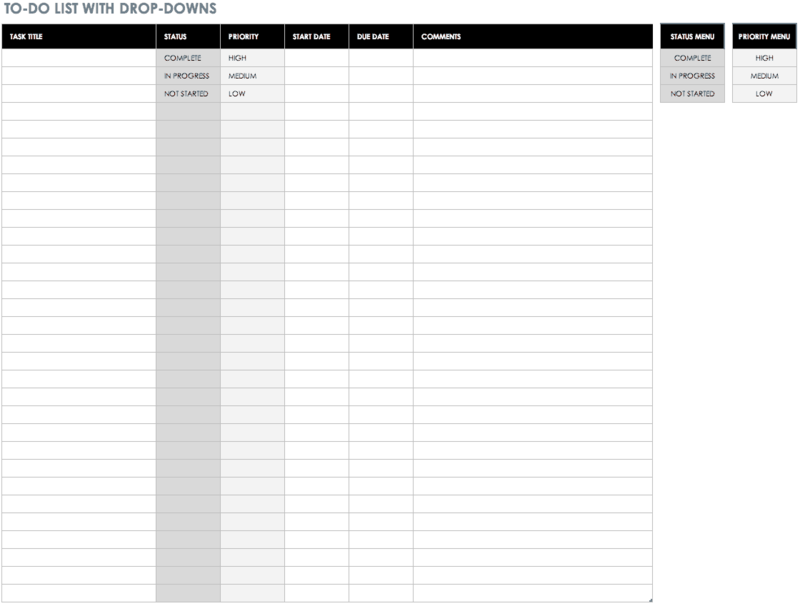 Use this template to keep track of inventory or equipment you either need or have newly acquired for a project. List each item number and name, followed by a description, date of purchase, cost, and other notes. Additionally, you can track initial value, loan details, and depreciation amounts for each piece of equipment in your inventory. This template is designed for human resources to ensure that a new employee (and other internal teams) complete all necessary onboarding tasks. The Excel spreadsheet includes columns for completing new hire paperwork and sending it to the appropriate parties, but you can edit the form to include any tasks that your organization requires of new hires. In addition, there is space to assign tasks to employees, to set due dates, and to list contact information. Use this basic template to make a shopping list; you can fill it out on your computer or print and complete it by hand. 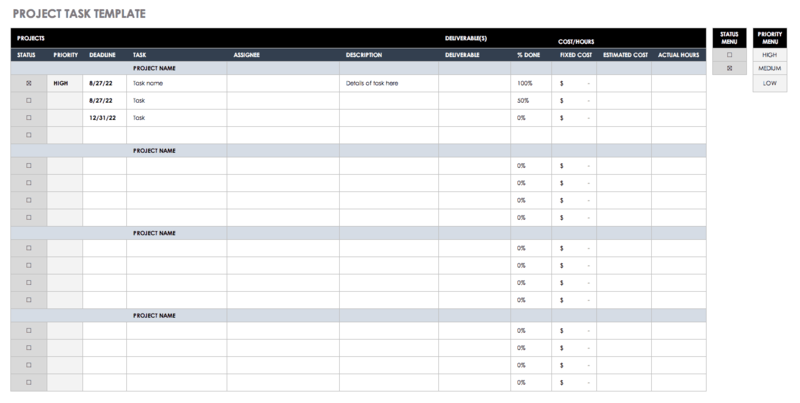 In addition to providing an easy-to-read table, the template includes a checkbox column where you can mark off each item as you obtain it, as well as a column for individual items and total cost. This template is created with grocery shopping in mind, but you can edit it for retail, gifts, and other consumer needs. Use this template to prepare for a recurring meeting. Note your agenda, attendees, action items, and whether or not the associated tasks have been completed. The template is designed with weekly meetings in mind, but you can edit the dates for a monthly, quarterly, or annual gathering. Preparing for a business trip may include managing staff adjustments at work, making schedule changes with family members or caregivers at home, and taking on extra work to prepare for the trip — plus, packing everything you’ll need on the road. 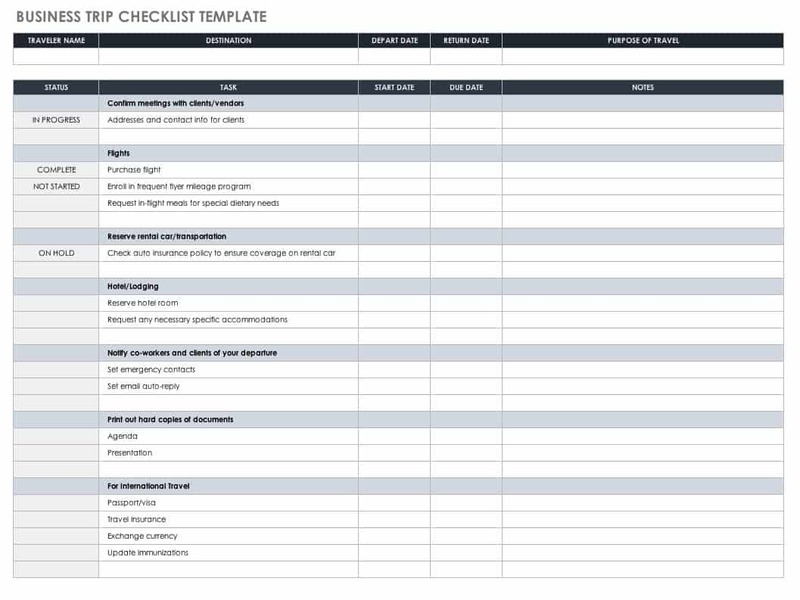 Use this business trip checklist template to help make the process more manageable and reduce the likelihood of forgetting a vital task or travel item. Edit the template to reflect your agenda, and then mark each item off your checklist as it’s completed. 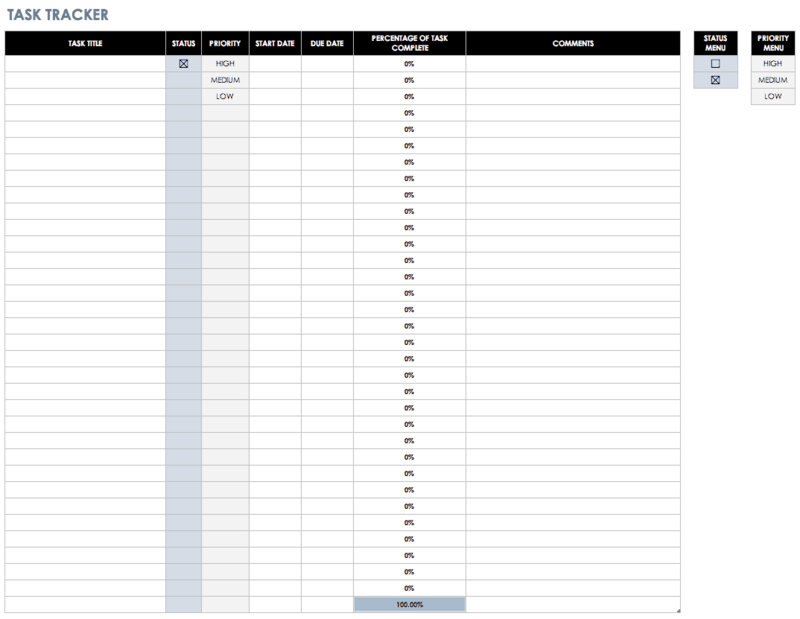 For personal use, you can also edit this template with relevant details for solo, family, or group travel. Students can plan for the week by using this free template to keep track of classes and assignments. 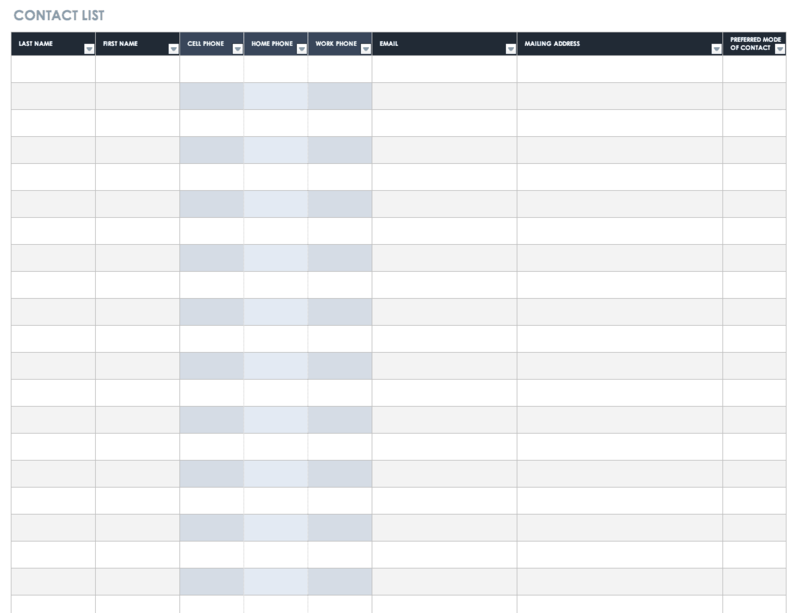 The template includes columns for listing the due date and status of each assignment, which helps students stay organized, prioritize their workload, and meet deadlines with less stress. This detailed day planner template provides multiple sections for planning various aspects of your day, from shopping needs to meals and appointments. There is also room for a general task list and a section to add items to be accomplished on another day. Customize the template by applying new labels to sections to match your daily routines. 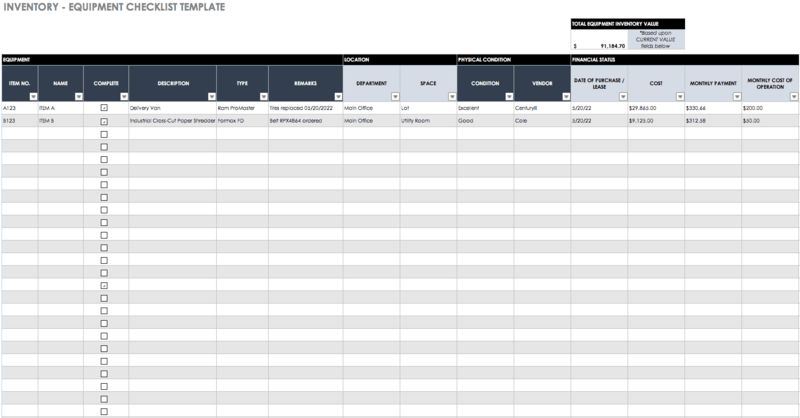 Use this simple business plan template to organize project tasks. The template is divided into phases so you can list tasks chronologically; it also includes columns for start and end dates and duration. Plus, a simple checkbox allows you to clearly mark which steps have been completed so you know your exact progress. 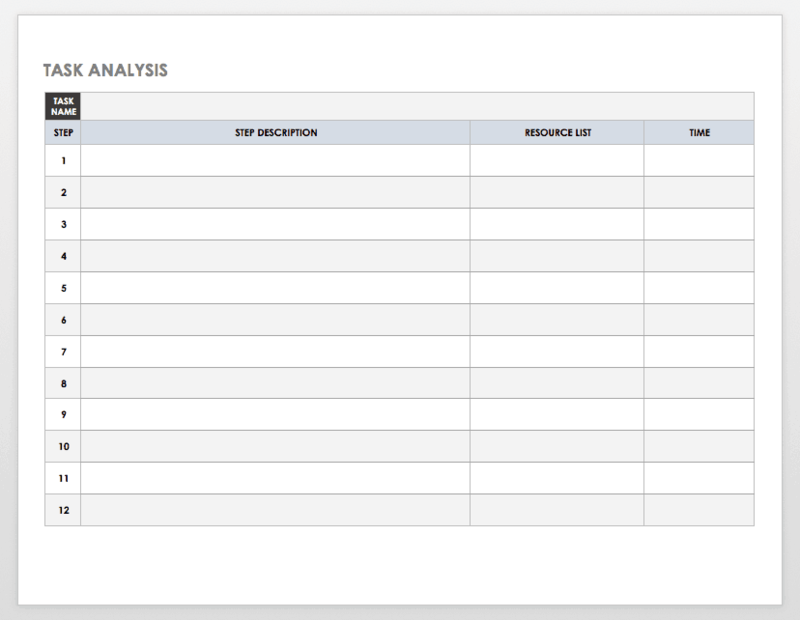 A job task analysis can be used to determine which actions are critical for a certain job. Identifying tasks in this manner can help determine the scope of a job, appraise employee performance, inform training methods, and improve work processes. On this template, you can list the tasks that are required to complete a job, then rate the importance of each task, along with how frequently the actions are performed. You can also document your source of information for each task. 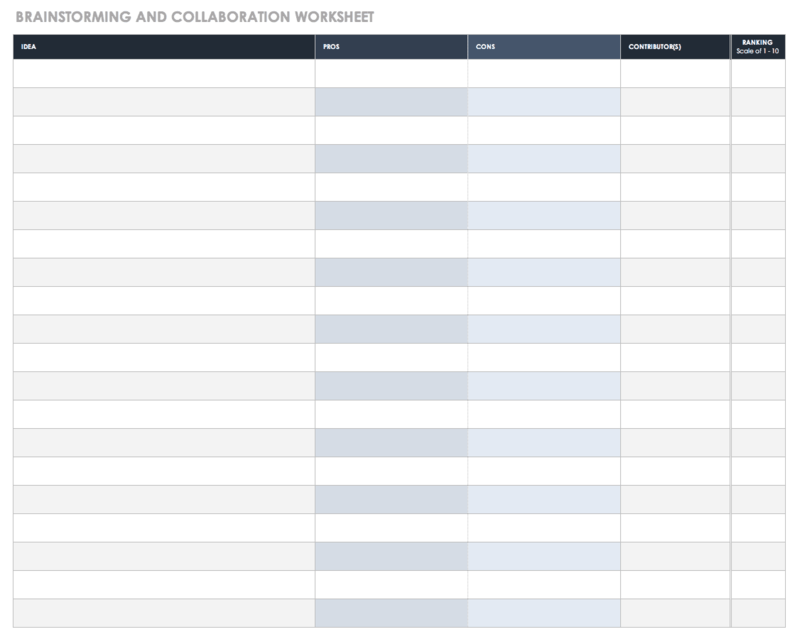 Use this form to record information from a brainstorm or collaboration session. The template includes space to list ideas, their pros and cons, and the originator. 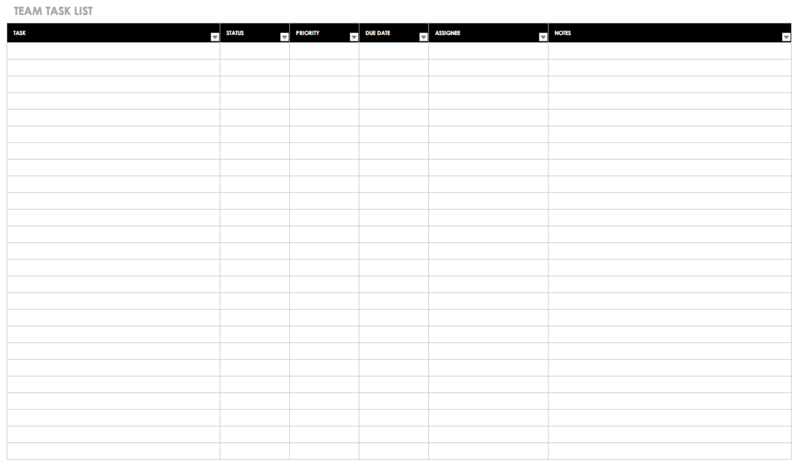 In addition, there is a column for each team member to rank each idea. 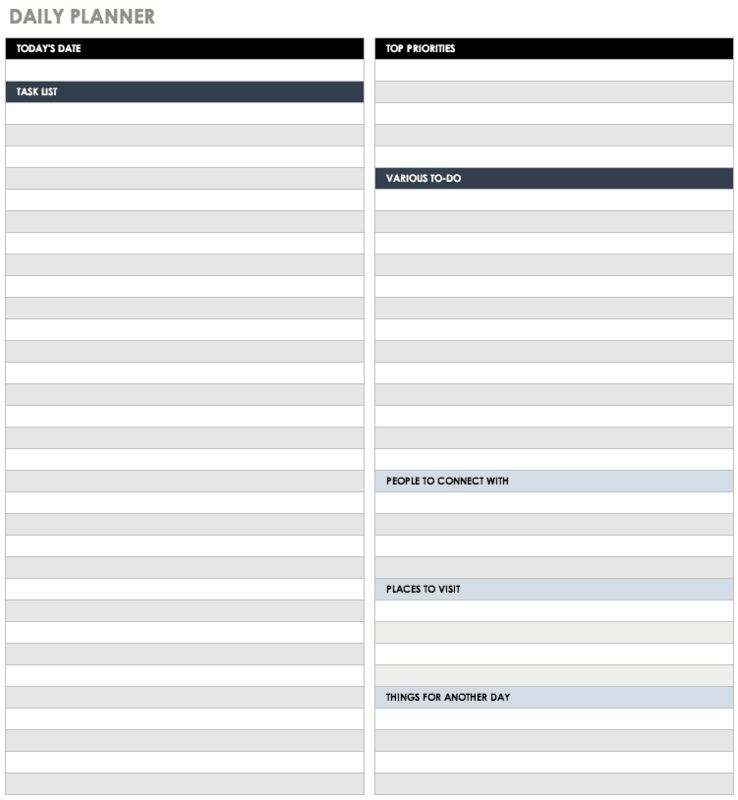 While this template doesn’t assist with idea generation, it enables you to keep all brainstorm information in one place so you can more easily compare ideas when it’s time to make a decision. Use this template to prepare for a financial audit. The simple template includes rows for every required document in a standard audit (general ledger, balance and financial statements, tax reports, etc.) and a checkbox to note if an item has been reviewed and is attached. Add or subtract rows to include every document that your audit requires. To learn more about how best to prepare for a financial audit, read this article. 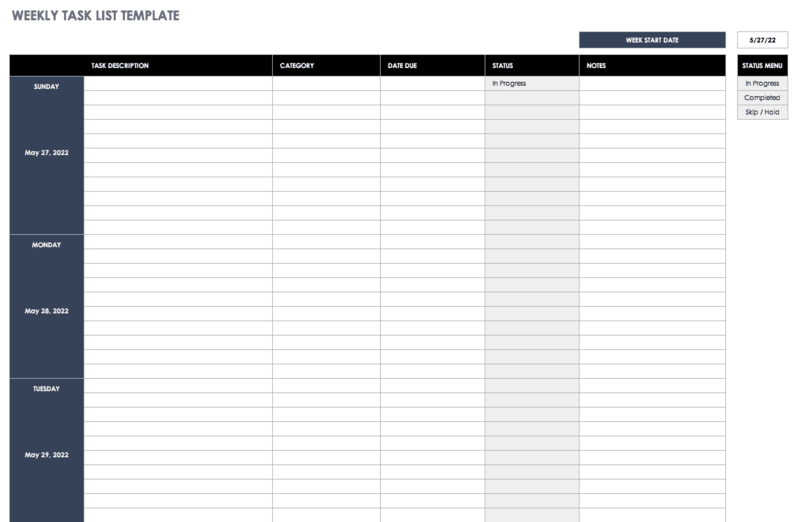 This Excel template can be used as a contact list for a variety of personal use cases, including for classes, group memberships, event attendees, or emergency communications. The template includes columns for phone, email, and address, as well as to note the preferred mode of contact. The form is fully customizable, so add or subtract sections as needed. Regardless of the task at hand, to-do lists provide an easy way for you to cross-check your work and ensure that nothing gets overlooked. However, using a checklist template is only the first step: To fully hold yourself and team members accountable, consider using a software tool that enables you to attach relevant documentation, track progress, and make updates in real time. 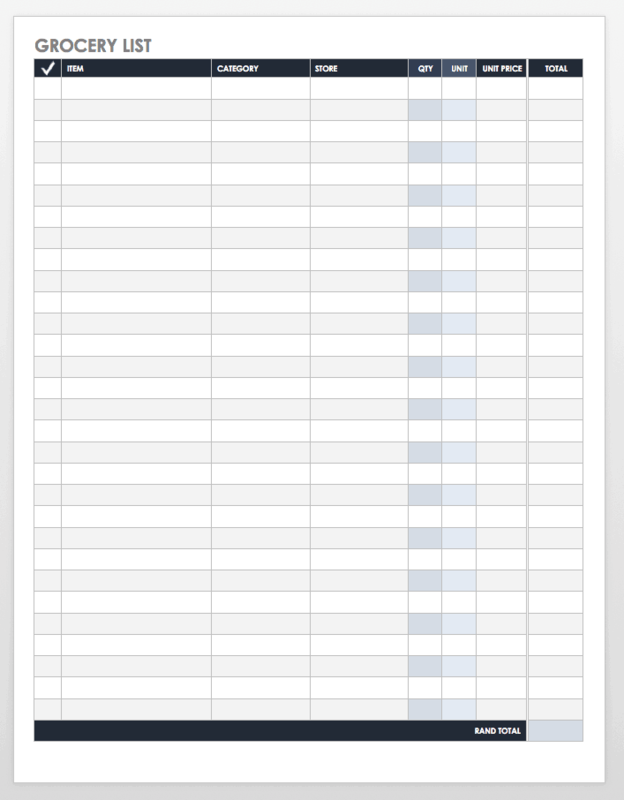 Smartsheet is one such tool. Smartsheet is an enterprise work management platform that is fundamentally changing the way businesses and teams work. Over 74,000 brands and millions of information workers trust Smartsheet to help them accelerate business execution and address the volume and velocity of today's collaborative work. I wish that I came across your site sooner - absolutely fantastic templates. I'm using 3 of them, one for work, one for my non-profit, and one for home. Thank you all so much! Thanks for sharing easy to use templates. Really cool and useful sheets!! Thank you so much for this great templates that you have made available for people. We are grateful for your great work. Thanks again. ABA. Thank you very much for these useful templates! very helpful!!! thanks for sharing!! !